On behalf of Mrs. DeRose, Mr. Mosley, and the Mona Shores Orchestra Parents Association (MSOPA), Welcome Back!!! The new school year is upon us and under way with some exciting events already planned and being planned for 2016-2017. First off, the 2016-2017 events have already begun. The Fiddlers have been rehearsing all summer and had a three day Fiddle Camp. They started their Summer/Fall Concerts tour this summer at the Sparta Celtic Fest, Roosevelt Park Day, and the Annual Muskegon Irish Association Dinner. 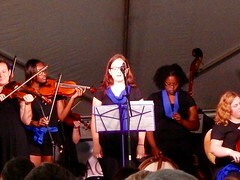 The Fiddlers next concert is Sunday, Sept. 18th, 10 AM at the Michigan Irish Music Fest. Thursday, October 27th, will be the 2nd Annual Spooktacular Concert. The orchestras fall concerts tackle Halloween and get a little Spooky Fun. This years concert will include the Ross Park and Churchill Elementary Traveling Choirs. Saturday, November 15th, at 7 PM is the 15th Annual Fiddle Fest featuring the Fiddlers and the Middle Fiddles with very special guest CrossBow. 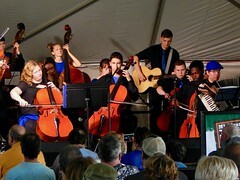 CrossBow is a high energy group out of GVSU that has been tearing up the celtic festivals. We will have more details on these events and other events as we get closer to the date. A complete calendar of events is on our event page and details of an event can typically be found on our Facebook Page. As most of you already know, we are also very happy to announce that Mr. Mosley is the Full Time Middle School’s 6th, 7th, & 8th Grade Orchestra Director. Mrs. DeRose will continue as the High School Director and assist with the 6th Grade at the middle school. Its looking like an exciting year ahead of us. Check back here, our Facebook Page or Twitter Page for the latest news and events. We will be adding some features to the webpage that I think some of you will really like. Have a great 2016-2017 School Year!! This week begins the back to school process with High School registration and Middle School Ports of Call. The MSOPA welcomes back orchestra students to a new school year, and also welcomes Mona Shores Alumn Mr. Nick Mosely as the new Middle School Orchestra Director. Mr. Mosely will be teaching Campbell and Lincoln Park 5th Grade Orchestra, 6th Grade Orchestra, & 8th Grade Orchestra. If you have more than one student, please bring them on the same day to save you time! The website is an active link to all things supporting the Mona Shores Orchestra and Fiddle programs by the parents and volunteers. With links to the MSOA Facebook page, Twitter page, our sponsors, and any other important information we need to share with you. We will be adding and changing pages as needed. To clarify Mona Shores Schools or its employees are not responsible for the accuracy or content contained on this site. This is not an official communication tool between Mona Shores Orchestra or its teachers. All communication to the teachers need to follow the protocols established by the teacher and/or the district.